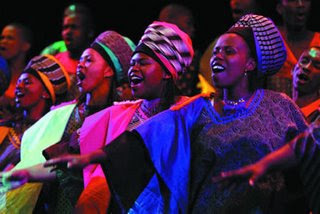 Last night I went to see the Grammy Award-winning Soweto Gospel Choir with its new show, African Spirit. The Choir has won critical acclaim and performed to full houses around the world, sung alongside Robert Plant, Bono and Peter Gabriel, and has been heralded as the most exciting group to emerge in world music in recent years. The choir has 26 amazing singers, dancers and drummers and everyone in the audience was on their feet dancing from the beginning. The African Spirit is alive and well and ........very contagious. Let's just say I woke up this morning and put on my best rainbow coloured clothes, was singing at the top of my voice and moved into the day in a whole new way with a whole new set of moves. Hilarious! Let's hope the choir's messages of peace can be just as contagious. Maybe the power of music can save the world. Here is their website to check if they are touring near you. May you too have a very HAPPY DAY! This was filmed in Amsterdam in 2007. The top image is really beautiful. That must have been an incredible show. What's interesting in the video is they're singing 'Oh Happy Day.' That's an 'American' Old South Gospel song. I expected something more African? I love African music!! I googled it: The song was actually written by an English clergyman in the 1800's, then revamped by the American blacks in the more flamboyant rendition that they were singing it. What's up with that Soweto!?! Be sure and ask them next time Lilly. Just to look at them is really invorgrating. That must have been great fun. Well they're certainly an amazing visual just in this short clip. Would you per chance have a larger jpg of this top image? I think I'd like to paint them. The colors are just incredible. Hi Vikki - no thats all I have, so if you just click on it and save to your computer it will at least be bigger. Do your do portraits - I was thinking abiut getting one of my daughter - http://fearlessandfabulous.blogspot.com/2008/05/message-from-your-daughter.html - her pic is on the end of this post. Can I email you about it or is it too hard to do from such a distance?